The new rifle features a single-shot Magnum Target Action coupled to a 26″ heavy barrel fitted with a big muzzle brake. The Target AccuTrigger adjusts to a minimum pull-weight of 6 ounces. Rifle weight, without scope, is 12 pounds. The gray/brown laminated stock features a near-vertical grip with a moderate amount of drop in the buttstock. We’ve used this same-type stock on other Savages. It is comfortable and works well with a bipod. However, you may want to add a “bag-rider” in the rear for better tracking. 1. Model 110 BA, Law Enforcement Series, $2638 MSRP. 2. Model 10/110 FCP HS Precision Stock, $1726 MSRP. 3. Model 11/111 Long Range Hunter, $1380 MSRP. Share the post "New .338 Lapua Magnum Target Rifle from Savage"
I have always resisted the temptation. Why would they put a muzzle brake on a target rifle? To reduce recoil on the 12lb. gun. Its noted as a target rifle yet it can not be shot in any NRA competition with a muzzle brake. The gun industry doesn’t restrict the term target rifle solely to conventional prone or F-class shooting. Just like the term “National Match”, it is used to denote a firearm designed for accuracy. A 338 Lapua is one cartridge that needs a brake, especially in a 12-pound gun. I applaud Savage for making a 338 that isn’t an uber-tactical rig. I would prefer the gun have a 28″ barrel of longer, but at least they’re doing something unique. If you want to sling up a 12 pound 338 Lapua with no break, go right ahead. I’ll applaud your effort, but I’ll stick with the Palma rifle or the 6BR. Its good with IBS and NBRSA. Obviously its no choice for NRA competition with a brake. 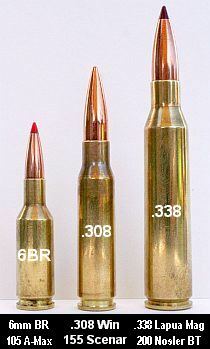 There are several f-class shooters shooters now using the .338,,,,,,,not this one. And exactly what would you use it for? Cartridge is no good for ICFRA F class competition and the brake excludes it from much more? Furthermore, why only a 26″ barrel? I see it as being a cheap source for a donor single shot 338LM action. While it may be “good” (accepted) by IBS and NBRSA, I have never seen a 338 LM anything listed on a match equipment list for either association. Their longest events are 1000 yards and 338 LM does not start to shine until well past 1000 yards. The official Savage name is “112 Magnum Target”. IMO, its labeled “target” because its single shot and “112 Magnum Target” sounds a lot more interesting, and focused, than simply “112 Magnum”. Actually it’s a cheap “learner” rifle for UR shooting. I should say, “might be” since I have yet to find anyone that has them in stock. The actual gun, as opposed to the photo, has the strong, solid top receiver of the single shot competition rifles, a real plus. For “Target” use it is, not to be confused with high round count “competition.” As a single shot, it’s neither tactical nor hunting optimized, though inherently more accurate than a repeater. Having built a 10kg F-class LM and used it in a two day match in balmy Houston, I can attest that wet-rag-scalding barrel heat is the .338 LM demon, heat unlike anything out there. By shot 4 to 5 your barrel is as hot as the 20th round of a .284. Recoil is of course stout, but knowing that you are so rapidly destroying your barrel’s throat negates concentration. I like the looks better than the amputee like stocks that are the in thing today. I like the singel shot, solid receiver. I am left handed so RH action is just honky dorie that way I can see what i am doing. Brake nice, 20 rnds per session good idea. All in all a winner for sure. I like it. As an owner of a high end 338LM rifle where I don’t want to wear out the barrel due to the cost of the barrel alone I will be looking into this. Want a longer barrel on this 112 Magnum? Buy an aftermarket barrel for $400. Don’t like the muzzle break? Buy an aftermarket barrel. Mine with an excellent muzzle break kicks like a wild Mustang so I can only imagine what it would be like without it. Target in the name could relate to the “target Accutrigger” versus the standard Accutrigger more commonly found on the other Savage rifles. Also figure in the laminate stock, not as much as Manners or H&S but a good laminate stock is upwards of $350, unless of course your looking at Boyds. Personally I like what Savage has done. As one person stated will be a good affordable donor but as it currently sits it looks fun for plinking AR500 plates at…..whatever yardage you want. Some posters clearly see the beauty of single shot rifles, and the function of this particular rifle. The others are clueless. They should relax and buy something else. I have this rifle and it kicks less than my 308 LOL. I don’t know if it’s the muzzle brake or what but it almost feels like it can not even feel the kick. I’m thinking of taking off the brake just so I can feel like a what they normal 338 Lapua kicks like.